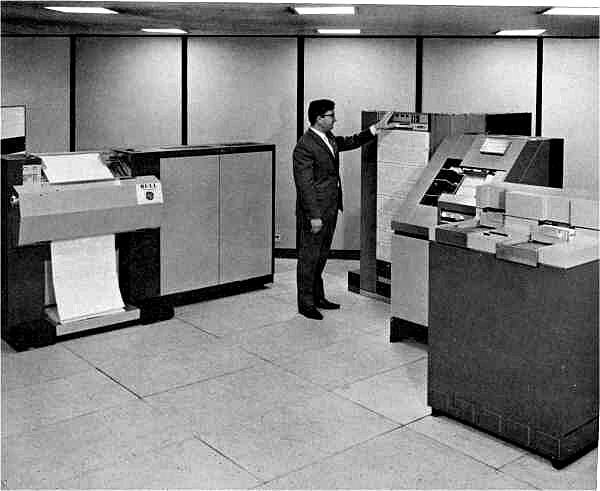 The GE-600 series shown below was a family of 36-bit mainframe computers in the 1960s, built by General Electric. The GE-635 was used for the Dartmouth Time Sharing System starting in 1965. A project to create a next-generation 645 started in 1967. Later, the new GE-655 replaced the individual transistors from the earlier models with integrated circuits, which nearly doubled the performance of the machine. GE sold its computer division to Honeywell in 1970 and the GE-600 series was renamed the Honeywell 6000 series with the 655 officially released in 1973 as the Honeywell 6080. 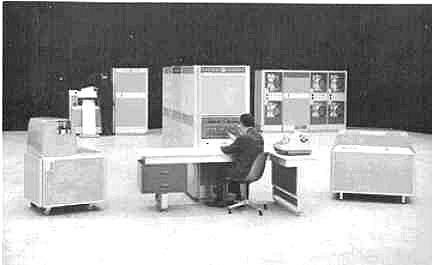 Shown below is a GE-415 medium scale computer designed in the early 1960s. The GE-400 series were 24 bit binary word computers with each word consisting of 4 BCD characters, or 4 decimal digits. Optionally, they included either a hardware or software emulator that would run IBM 1400 series programs. Four upward and downward compatible processors were available; the GE-415, GE-425, and GE-435 and later the GE-405 was introduced as a GE-400 series entry system. Each series had faster cycle times and a floating-point hardware option was available for scientific users. multiprogram up to seven programs depending on the availability of core memory resources. Shown below, the GE-115 was marketed in the US and by Bull-General Electric in Europe under the name of Gamma 115 and was manufactured by Italy, by Olivetti. After the 1964 take-over by General Electric, Olivetti computers became OGE Olivetti-General Electric and were sold in the worldwide market. The GE-115 was a small scale computer generally used as a replacement of card punch equipment and as a remote batch processing terminal connected to GE-400 series medium scale and GE-600 series large scale computers. Many GE-115 systems were equipped with tape drives and eventually with magnetic discs. The system used typical second generation technology; discrete transistor logic and core memory. GE-115 production was suspended in the mid-1970s, replaced by the Honeywell Level-62 and by the Level-64 which featured an emulator for the GE-115. The General Electric 225 shown below, connected to a GE Datanet 30 front end processor, was the computer Dartmouth College chose to develop the Dartmouth Computer Timesharing System, or DTSS for short. The Dartmouth project was the first large-scale time-sharing system to be implemented successfully. The project began at Dartmouth College in 1963 by a student team headed by John Kemeny and Thomas Kurtz aimed at providing easy access to computing facilities for all members of the college. The GE-265 was the first commercial time-sharing system. It consisted of a GE-235 processor and a Datanet-30 communication processor. The two processors were interconnected through a direct interface with both sharing a DS-20 disk unit.